Warwickshire Sheet 13.12 Edgbaston 1901 - published 2000; introduction by Richard Abbott This detailed map covers much of Edgbaston, with coverage ..
Warwickshire Sheet 13.15 Harborne (South) 1901 - published 2009; introduction by Malcolm Nixon The map also includes Worcestershire sheet 5.15. Thi..
Warwickshire Sheet 14.13 Moseley 1913 - published 1996; introduction by John Boynton This detailed map covers the area of south Birmningham that in..
Worcestershire Sheet 10.04 Selly Oak & Bournville 1903 - published 1999; introduction by John Maddison This detailed map covers an ar..
Warwickshire Sheet 13.12a Edgbaston 1887 - published 2012; intro by Malcolm Nixon. 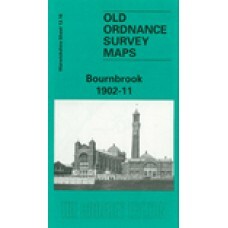 This detailed map covers much of Edgbaston, with cover..